The DC90 was designed as a self oscillating mixer for 88-108MHz FM portable receivers so should have a reasonable HF/VHF performance as a crystal oscillator. The circuit to the right is a parallel mode fundamental and overtone oscillator which was favoured by Heathkit using indirectly heated valves in a lot of their multi-band HF receivers and transmitters. If a series cut crystal is used the parallel resonant frequency will be several KHz or more away from the series resonance. L1 should be adjusted just down the slow side from the peak of of the tuning characteristic for reliable starting. L1 / C1 should be a high L/C ratio. This is a suggested circuit for a VFO for an HF receiver/transceiver and takes the form of a ‘high C’ Colpitts oscillator. Output 1 has a high impedance and output 2 has a much lower impedance. A stabilised supply and some form of buffer to isolate the oscillator from the following stage(s) should be used for best frequency stability. Test were conducted with a 1L4 with several different feedback capacitors and with C1 and C2 omitted and the results shown below. L2 had a 1K resistor temporarily wired in parallel to minimise circuit loading by the test equipment. The impedance at the anode is very high and it was noted that connecting a 10:1 scope probe would stop the circuit from oscillating on the higher frequencies so a low capacitance probe was developed and constructed as shown here. The circuit starts reliably and the test point voltage and output power are both an indicator of crystal activity. The AC voltage at the anode varied from 55 - 80v pk-pk. Crystals above 61MHz were tried but would not oscillate. The anode current is about 2.2mA when not oscillating and 3mA when oscillating. The turns ratio of L1 to L2 should be about 10:1 with one turn minimum on L2 and positioned at the cold end of L1. The output power will be a few milliwatts. The typical anode current was 400uA. The circuit shows extremely high impedances and relatively small signal levels as would be expected with the measured low power consumption. It is obvious from the results that using the same value for C3 and C4 results in marginal feedback conditions at the high frequency end of each tuning range. Much better results were noted with a higher step-up ratio in the feedback capacitors (C3 less than C4) and lower overall values compared to more conventional indirectly heated valve circuits. 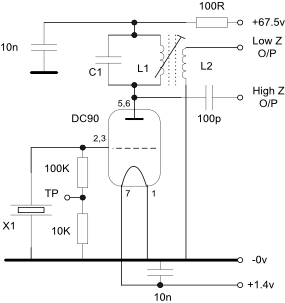 A buffer circuit should be used to isolate the following circuits from the oscillator.